The Hubbell Duplex Side “A” is located on Historic Route 66 which is part of the Sixth Street Historic District. The district has evolved into a hub for the city’s nightlife and shopping. There are plenty of restaurants, antique stores, art galleries and local bars in historic buildings. If you’re interested in the golden era of Route 66, then this is where you can experience a glimpse into the glory days of Route 66. Charming and cute. 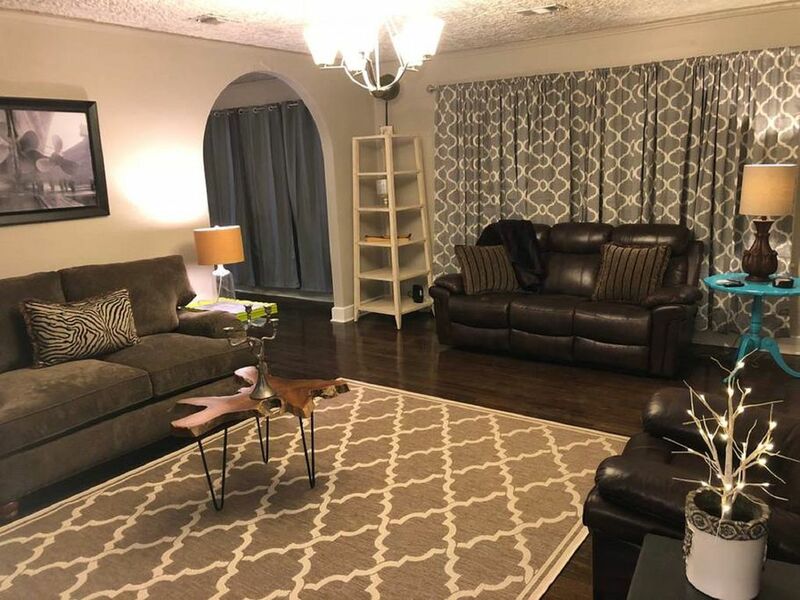 Large one-bedroom duplex with formal dining area, huge living room with fireplace, master bedroom with king bed, full kitchen, there is another room that has a daybed and closet, and laundry room with washer and dryer. 1196 sq ft, so there is plenty of room to relax. Original hardwood floors. The outside features a nice patio and fully fenced yard. Designed by Guy Carlander, a well-known and prominent local architect. The Hubbell Duplex gets its name from Mr. and Mrs. Hubbell, who in 1925 hired Mr. Carlander to design the Hubbell Duplex. The duplex is known for its Craftsman style, which includes battered brick columns supporting the dual entry porticoes. The Hubbell Duplex is part of the Historic District and is listed on the National Register of Historic Places. The Historic Route 66, Sixth Street District is comprised of 13 blocks along Sixth Street and includes several vintage service stations, art galleries, shops and buildings in different architectural styles from the 1920’s to the 1940’s. When in Amarillo make plans to also visit the Cadillac Ranch, The Big Texan Steak Ranch and Palo Duro Canyon State Park. We are "dog friendly" and have a few guidelines for our guests with furry friends'/fur babies. - Guest are responsible for cleaning up any pet waste. - Please keep pets off furniture and bedding. - Please remember to clean your pet's paws when they come inside. -If it has been raining or snowing, please make sure pets do not track mud inside. Any evidence of not following these guidelines may incur extra cleaning fees. Leather Sofa and Chair - Both are electric reclining. Additional love seat. Very nice home. Lots of welcoming, thoughtful touches. Nice location to various parts of town. Be aware second bedroom is very small. Can't be beat otherwise. Our family rented both sides of Hubbell. We were able to get 9-11 of us together every night for dinner and cards. Everything we needed was available: the kitchen was fully stocked for cooking and serving. Rick and Brandon made sure that our every need was met for the entire week. Highly recommend and will rent again if we head this way! Convenient to local restaurants shopping and the VA hospital. Great place to stay. Loved the duplex. Always nice to be able to select a place like this when passing through for one night. Amazingly clean, beautiful and cozy! Loved the beautiful decor and absolutely stocked with everything a guest would need! Super classy & relaxing atmosphere!